My love for mangosteens or มังคุด Mang Kut (the first syllable rhymes with “young” and the second with “put”) is legendary. There’s even a picture of me as a toddler sitting next to a gigantic pile of empty mangosteen shells with curious purple stains around my lips. With an innocent face, I stare blankly at the camera as if to say — I have no idea who ate these. Informally dubbed “the queen of fruits,” taking a second place only to durian, the reigning monarch of the fruit kingdom, mangosteens have proven themselves worthy of the royal title. The flesh boasts a variety of textures: crunchy in some places, firm in some places, but mostly soft and creamy. The flavor is a combination of sweet and a tinge of tartness. I was recently asked on Twitter to describe the taste and texture of a mangosteen and I struggled greatly before arriving at what I thought wasa pretty lame answer, though I couldn’t come up with anything better. The truth is there’s nothing like Mang Kuts. Sadly, fresh mangosteens aren’t always readily available in the US. They usually come frozen or canned (shudder) in most Asian grocery stores. Otherwise, mangosteens are marketed in juice form as one of the tropical super-fruits. I have sometimes seen fresh mangosteens at a local Vietnamese market, but there’s something about those fresh mangosteens being capless and bald that has always stopped me from buying them. They may actually taste fine, but they look a bit scary to me. Just moments after landing in Bangkok, I dashed to the nearest green grocer and brought home a big bag of fresh mangosteens. Although it may seem like I lacked the patience to wait until I at least unpacked and put on some fresh clothes, the truth is — I was doing this for all of you. Someone needed to take on the responsibility of cracking open these purple beauties so a blog post could be written about them. I am not a glutton; I am a responsible food blogger. The anatomy of mangosteens is quite interesting. Each one is about the size of a tangerine. They come with four greenish caps at the top. Turn them upside down and you will see the brown raised ridges that look like flowers. The number of the “petals” corresponds with the number of sections in each mangosteen. In other words, you know how many sections are inside a mangosteen just by looking at its bottom.The question you may have is — does it matter how many aril sections there are in a mangosteen? Yes and no. In general, the bigger the section, the bigger the seed underneath the aril. Large seeds need to be spit out and that causes a mild inconvenience. Smaller sections contain no seeds at all or very tiny ones that can be eaten whole. A larger number of sections, therefore, means each section is often smaller in size. This means more edible flesh and fewer seeds to spit out. But, to be quite honest, in a grand scheme of things, this doesn’t really matter all that much. Good mangosteens sport healthy-looking green caps and a nice glossy sheen on their outer skins. They should be firm and have no cracks with juices oozing out or bugs under the caps. Steer clear of ones that have hardened beads of yellow resin on the outer rinds as those often contain sections that have suffered from resin seepage. The yellow sections in the picture above are very bitter. Good mangosteens have aril sections that are opaque white, firm, and not translucent or yellowish. 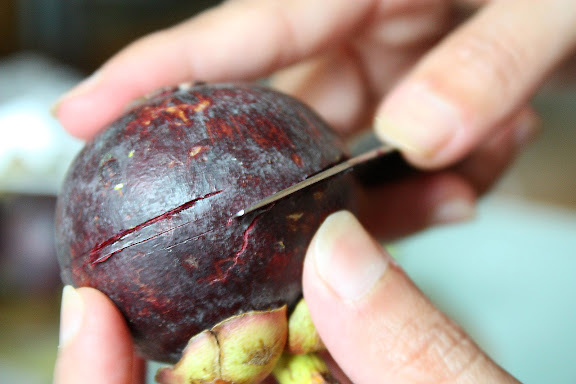 To cut open a mangosteen, with a sharp paring knife, make a 1/4- to 1/3-inch deep horizontal cut around the middle and twist off one half of the shell, exposing the white, creamy flesh. (Knifeless? Fret not. Hold the mangosteen between your palms and squeeze your hands together to crush open the purple shells. Once the shells are cracked, you can easily peel them off. It’s a bit more messy and sometimes results in the sections getting crushed along with the shells, but hey …) Mangosteens are often served half exposed to allow people to pick out the flesh with a small fork. See the sections inside this one? The two larger sections contain hard and bitter seeds that need to be spit out; the other five sections can be eaten whole. Two large sections out of seven aren’t too bad, though better mangosteens contain all smaller sections with but one large seed or none at all. Mangosteens are generally eaten raw and unadorned. But some people juice them, shell and all. Some make ice creams, sorbets, and fruit salads with them. Some turn them into savory dishes — an idea I’m interested in exploring further. really, i am so jealous. it’s been YEARS since i’ve had a mangkud. it did take me awhile to come around but when i did, i would fight over them with my mother. You now know the story of my first mangosteen experience! But my husband and I were hooked immediately. Definitely have not seen any fresh ones hereabouts so I will have to bide my time; it would make a good excuse to visit Asia, wouldn’t it? Next time, I will be prepared with a paring knife . . . Thanks for this great information – I didn’t know the part about the bottom petals indicating the number of sections inside. Now, I’m in the know! I appreciate your blog dedication…I think I have seen some mangosteens in Chinatown but as I recall they were like 10 bucks a pound – I need to double check this…see what you have done you have made me want these no matter the cost! It’s been forever since I’ve had some mangosteen. I agree that it’s not as available as other fruits. You do bring up a good point about how asian fruits and items had become the “superfoods” of the US. LOL. I guess they kind of figured out what they’ve been missing out on. This is just not right. You know what? I’m gonna go to Argyle this weekend and buy irradiated mangosteens and durian, quality be damned. Need now. We have fresh ones in SF and I have a photo to prove it, – they’re in a bag so I cannot tell if they are bald – happy to send photo to verify. I’m afraid to try as I loved the mangosteen I encountered in HK and Singapore and feel these will pale in comparison – like grocery store tomatoes – yuck! I’ve seen these, but never tried them. Now that I know how to do eat one I’ll have to try one next summer. If your first job in Bangkok was to relive a mangosteen they must be good! I need to get on a plane because I want to sample both mangosteens and durian at their best! Oh man I’ve never seen one of these before… very strange looking. Interesting ingredient I must try one of these. I really miss this! We always eat this with durian and rambutan =) I’ve never cut it open with a knife though, I always use my palms. You teach us so much! We’ve clearly never heard or seen a mangosteen before. It’s cool when you cut it open. Thank you for being such a dedicated blogger and we obviously all look forward to your posts! I’ve seen this is Asian markets and they look very pretty. If I don’t like durian, do you think I would like this? I will definitely go out and get me some! First time reader, but I am in Thailand at the moment and I saw a link on SeriousEats and had to click over to voice my love of this delicious fruit! My friend and I bought a kilo on the street in Chiang Mai the other day and walked while cracking into these babies, not caring as they stained our hands bright sticky red, making it impossible to do anything except continue devouring the mangosteens. I will miss these very much when I go back to the States. Aww this is my favorite tropical fruit. Makes me want to buy tickets to Asia and gorge myself with a tons of longans, jackfruits and mangosteens. I’m so envious! I finally found another store that has mangosteens, but I’m a scared of making another expensive ($6.99/lbs). The last store I bought them at, I literally only got one bite out of the enitre pack, and everything else was rotten (they looked alright from the outside). Does anyone have any tips on spotting ones that have gone bad? This post of yours totally brought back my childhood memories and those where the days where I had plenty of mangosteens – for breakfast, before lunch, lunch, after lunch, before dinner, then after dinner! Those days have been over 20 years ago! Like you mentioned, I had seen mangosteens at some Vietnamese grocery stores but I could never convince myself to buy them, for the same reason! I might as well reserve a plane ticket and travel wherever the mangosteens are fresh then stuff my face with it! I love mangosteens! I first tried them in a first trip to Thailand and they are like no other fruit that I’ve ever tried. true, so hard to describe the flavour, but to say how delicate it is. Sweet with a light tartness, but a wonderful creamy texture. Since then, I’ve been 3 more times to Thailand and bring some back (I live in Spain, so here they don’t even exist! )…I just learned about the “petals” underneath! I always wondered how to choose those without seeds…For the next time I manage to find them, I’ll know! Great post! Thanks, Colette! Even here in Chicago, good mangosteens are hard to come by, and if you see them at all, they’re look bald and sad like this http://www.apartmenttherapy.com/uimages/kitchen/2008_06_06-Mangosteens.jpg after having been irradiated. The caps either fall off or are removed, the flesh soggy and water-logged, and the shells way harden and become way too tough to crack open with your two palms. Sad, really. And the canned version? Don’t even get me started on that. Ew! Canned มังคุด +_+ Have never heard of such a thing and am not impressed. มังคุด is what i miss most about Thailand… along with my family ^o^ Oh, and good explanation regarding the pronunciation of มังคุด I tried saying it following your explanation and it sounds more correct than when foreign people just read it the way they think it should be read. There is no way to explain the tone for the “คุด” to a foreigner though…because it’s not completely flat. Oh well, that is to be expected. I love your blog I’m at boarding school abroad now and am craving thai food like crazy. I left just before มังคุด season and my parents wouldn’t let me buy a bag of just four มังคุด for 100 or so baht! Anonymous – Thanks!! Canned mangkud is the personification of all things evil in this world. When people say they hate mangkud, it’s most of the time because the only version they’ve had is either canned or irradiated-then-frozen. All imported mangkuds I’ve seen in the US are irradiated and bald (the green caps have either fallen off or been removed). What do they look like in Europe? Once when I was a kid, I tried to take four of them on the plane with me back from Thailand to California. It turned into most depressing confiscation of my thus-far lifetime :< But I supPOSE it was all for the greater good fruit flies tree crop growing blah blah blah... But still, because they are my favorite fruit, I love them even canned. Beggars can’t be choosers, right? I always love to read the complex ways people try to describe the taste of the mangosteen using familiar foods (it’s peach and lemon and banana…) and noone ever seems to come close.